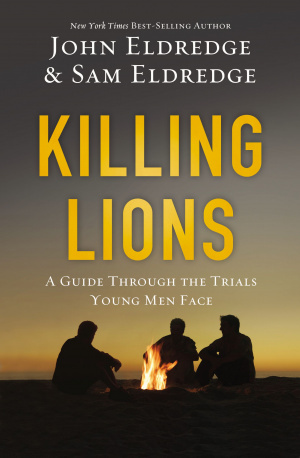 In Killing Lions John and Samuel Eldredge give you an essential guide through the trials that young men face. The challenge before you, say the authors, is a bold one: to accept the wild, daring adventure of becoming a man. We want to be self-sufficient. Find our own direction as we pursue our dreams. Know it all and never ask for help. Isn't this how most guys approach manhood? On our own, pretending we are doing better than we really are? But sooner or later the thrill of independence gets lost in the fog of isolation. It's time to take the pressure off. We were never meant to figure life out on our own. This book was born out of a series of weekly phone calls between Sam Eldredge, a young writer in his twenties, and his dad, best-selling author John Eldredge. Join the conversation as a father and son talk about pursuing beauty, dealing with money, getting married, chasing dreams, knowing something real with God, and how to find a life you can call your own. Killing Lions by John Eldredge and Samuel Eldredge was published by Thomas Nelson in October 2014 and is our 8471st best seller. The ISBN for Killing Lions is 9780529116918. Be the first to review Killing Lions! Got a question? No problem! Just click here to ask us about Killing Lions.